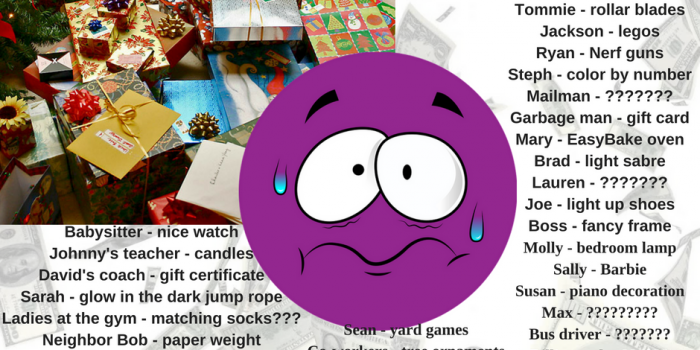 Home > Blog > WARNING: Holiday Stress Approaching! WARNING: Holiday Stress Approaching SOON! Consider the gift of TIME: Spend some time with your children rather than buying gifts that will require/tempt them to spend time isolated in their rooms (ie. Electronics/technology). They may be upset with you but you are doing them a favor. Write a short THANK YOU: Grab paper and pencil and write a heart-felt thank you. This is a great, personal way to bless someone during the Christmas season by making them feel appreciated – and it doesn’t stress your wallet! Invite them to CHURCH: What better way to spend the Christmas season than celebrating the Reason together? DO something TOGETHER: Play a family game, do a family craft, make a family dinner, go sledding, or go look at Christmas lights! White Elephant/DRAW NAMES: No need to buy something for everyone. This is a great way to interact with a group of people without the stress of buying EVERYONE a gift! Have a neighborhood PROGRESSIVE DINNER: Have hot chocolate at Sally’s house, appetizers at Jim’s house, dinner at Matt’s house, and finish up with dessert at Trish’s house. This keeps everyone together, and you are spending time with one another, not money. Think HOMEMADE: bake goodies and deliver them to people, give coupons for babysitting or lawn mowing to someone who needs help, make Christmas Ornaments for your family and friends…the list of possibilities is endless. The Reason for the Season is Jesus and celebrating God’s gift to the World. Share the gift of Jesus, time, and personal relationships – not material things that you stress over purchasing!